i'm having a thing for sticky vinyl lately . . . i want to do some in my house - but i'm sure if i start I'll go crazy an put it everywhere - so i really need to be deliberate and plan what I'm putting where. i've been looking around for a few months now - these are just a couple of the ones I adore, i plan on doing a mock of what i want to do in photoshop so check back for that. 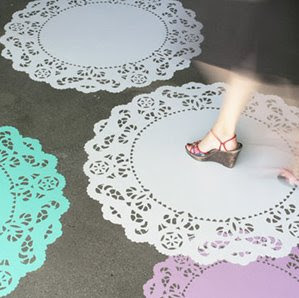 if i ever have a home office I really want to have these on the floor - particularly the mint/teal one. I'm definitely ordering these as soon as i have a laundry room.